Galliano Ferro formed his own glass factory in 1955 after leaving Arte Vetraria Muranese, or AVeM (A.Ve.M. ), which he co-founded in 1932. Designers at Galliano Ferro include his son Giorgio Ferro, Ezio Rizzetto, Fulvio Bianconi and Vinicio Vianello. Giorgio Ferro became head of the company in 1972. British importers Jaffe Rose are known to have imported some of their work, applying their own "Jaffe Rose, Murano Glass" import labels. PLEASE NOTE: Most of the items shown in these sections are from our past sales, and are no longer available. To view our currently available stock, please visit our online shop section. 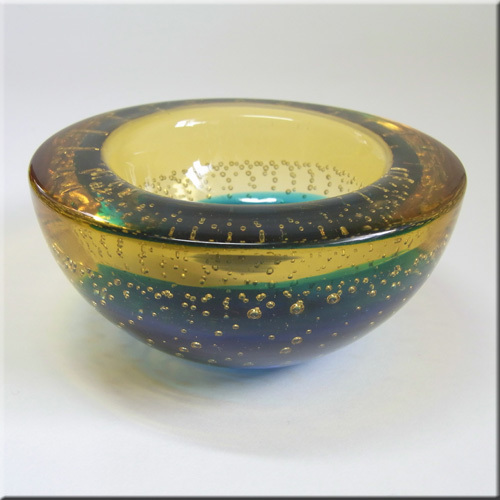 Galliano Ferro blue glass bowl with latticino, silver leaf + copper aventurine, labelled. Very similar to the AVeM 'Tutti Frutti' bowls. Galliano Ferro blue + amber glass bowl with bullicante effect, labelled. Galliano Ferro lilac/smokey blue + dark green glass candlestick holder with bullicante effect, labelled. Made in neodymium/alexandrite colour changing glass. Galliano Ferro uranium yellow + orange glass bowl with bullicante effect. Galliano Ferro clear + amber glass bowl with bullicante effect. Galliano Ferro blue + green glass bowl with bullicante effect. Galliano Ferro uranium yellow + amber glass bowl with bullicante effect. Galliano Ferro blue + green glass biomorphic bowl with bullicante effect. Galliano Ferro blue + green glass biomorphic bowl with bullicante effect. Galliano Ferro blue + green glass bowl with bullicante effect. Galliano Ferro blue + green glass biomorphic bowl with bullicante effect and Jaffe Rose import label. Galliano Ferro blue + lilac neodymium glass bowl. Galliano Ferro uranium green + blue glass bowl with bullicante effect. Galliano Ferro blue + green glass biomorphic bowl with bullicante effect. Galliano Ferro red glass bowl with bullicante effect. Murano orange + uranium green glass bowl with dimpled effect, probably by Galliano Ferro. Murano uranium yellow + amber glass stem vase, by Galliano Ferro, labelled. Murano purple + blue glass stem vase, probably by Galliano Ferro. Murano red + amber glass stem vase, probably by Galliano Ferro. Murano uranium green glass stem vase, probably by Galliano Ferro. Murano red + amber glass stem vase, probably by Galliano Ferro. Murano red + amber glass stem vase, probably by Galliano Ferro. Murano red + blue glass stem vase, probably by Galliano Ferro. Murano green + amber glass stem vase, probably by Galliano Ferro. Murano purple + blue glass stem vase, probably by Galliano Ferro. Murano blue glass stem vase, probably by Galliano Ferro. Murano amber + blue glass stem vase, probably by Galliano Ferro. Murano amber glass stem vase, probably by Galliano Ferro.